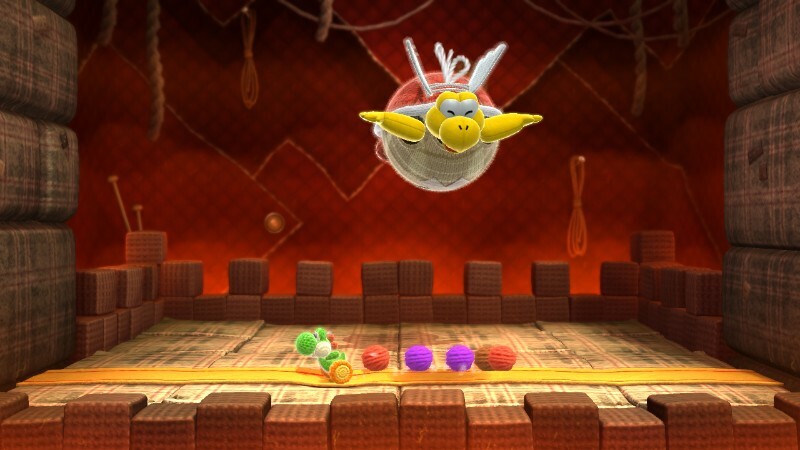 Another staple of each world are the boss courses, one for a mini boss and one for the big boss. 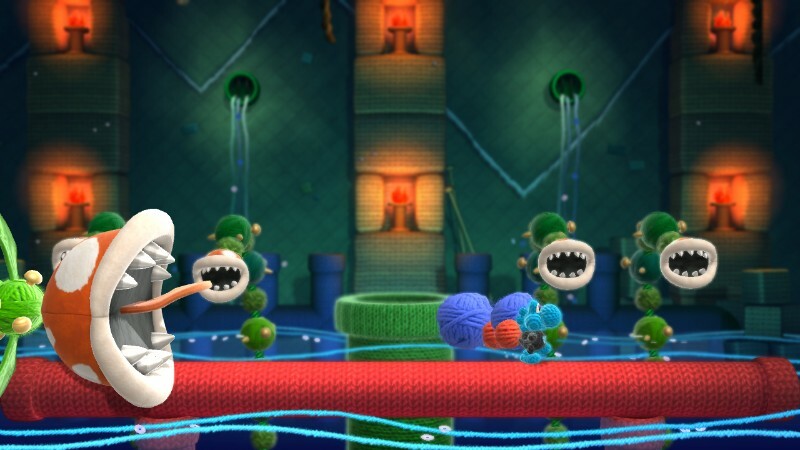 Each boss is lovingly rendered in yarn, and they really pop visually. They also typically make use of 3D effects, leaping back and forth between the background and foreground. I can only imagine how incredible that would look on the 3DS, but it still looks pretty cool on the Wii U. 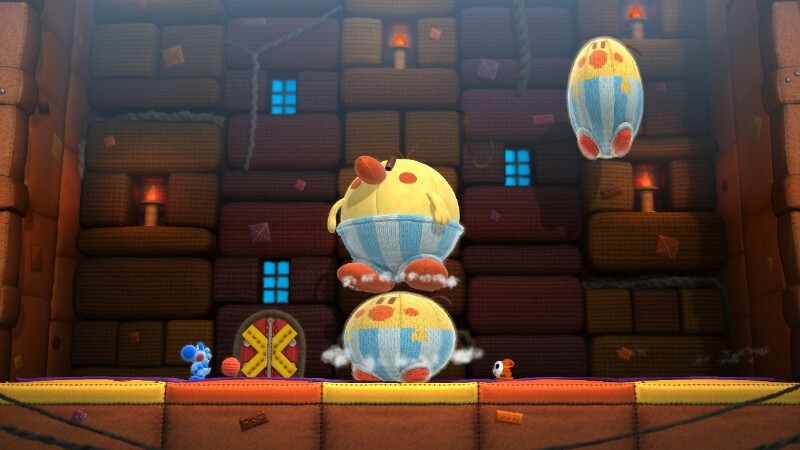 While each of the main bosses is unique, the mini bosses are reused a bit. Granted, each time you fight them they’ll have a new gimmick, but I would have preferred having all the bosses be unique. Furthermore, most of them are pretty easy once you get their pattern down and recognize their weakness, but even then I died a few times against the later bosses. I would say that, overall, the boss fights in the original Yoshi’s Island were probably better. However, the fight against Miss Cluck the Insincere is a very memorable and fun one. On the visual side of things, what can I say? The game looks utterly remarkable, full of lush, vibrant colors. You can almost feel how soft the levels look. It’s truly remarkable how well everything translates to Good-Feel’s signature look. What’s especially impressive is how effects such as fire and water are handled with yarn. You’d think they would look cheesy, but scarves of lava are still quite menacing, and the way threads of blue ripple in a body of water is breathtakingly beautiful, and quite a bit strange. On the audio side of things, the game is less impressive. 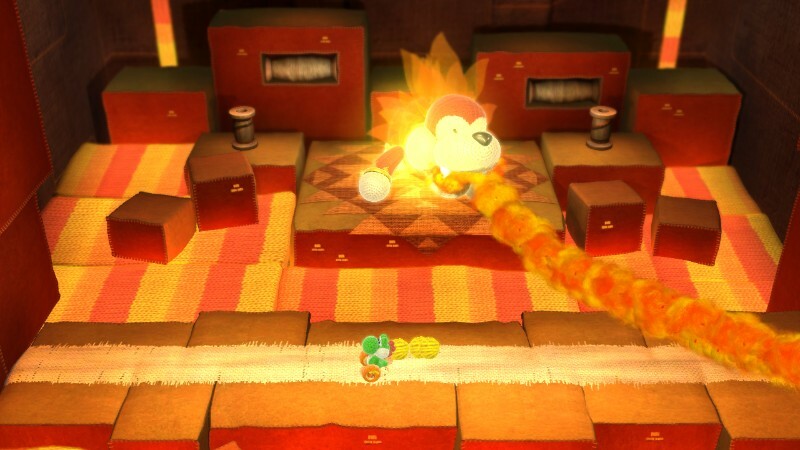 While the sound effects are great, such as the way Yoshi grunts as he flutter jumps, the frenzied sound of platforms knitting themselves to life, or the pop of Bullet Bills firing, the music is less so. My problem is how mellow most of the songs are, completely lacking any sense of urgency. Granted, there is no time limit in courses, but I still prefer a more frenetic soundtrack. There are a few fast paced tunes, but they are overwhelmed by the torrential tide of slow, easy listening songs. 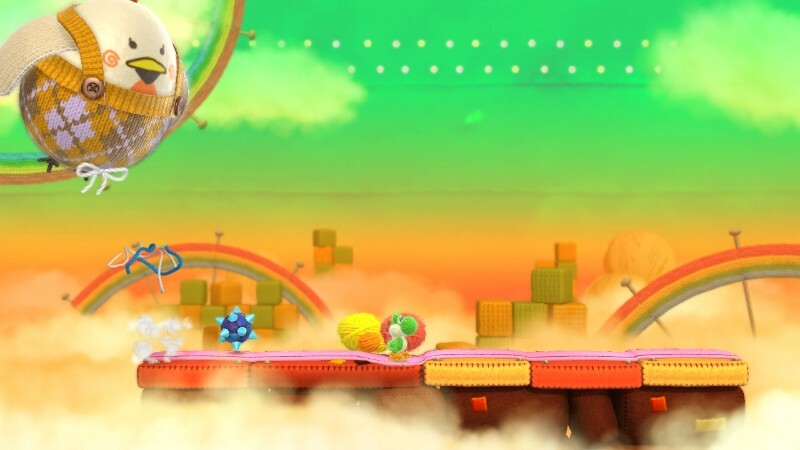 Though I mentioned earlier how clever the mixture of elements in the game is, it bears mention that some stages in the game, probably between 20-30%, are utterly brilliant, making intuitive and smart use of the gameplay mechanics. Granted, none of the courses in the game are boring or poorly made, but when held up against the mirror of these stages, they don’t hold up so well. 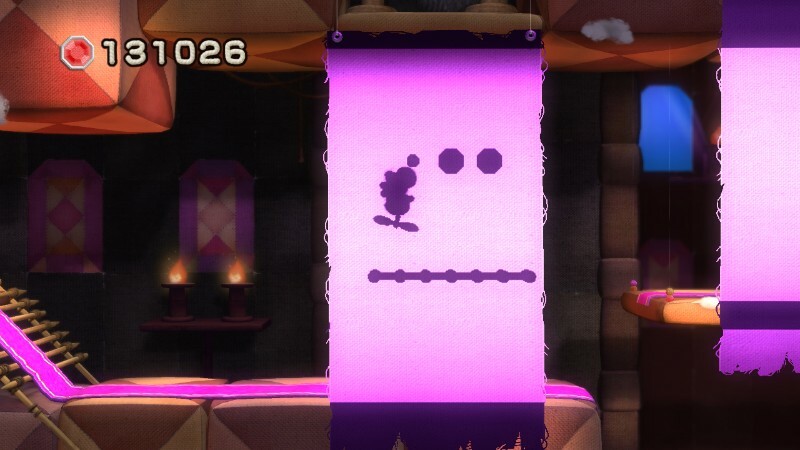 To list a few of my favorites, there is one Pyramid level populated with Shy Guy Pharaohs who knit themselves back to life after being eaten; the Spooky Scraps stage, where parts of the stage can only be traversed while revealed by a eerie curtain, and regular enemies are transformed into hungry ghosts; and the Fluffin’ Puffin stage, where Yoshi collects and hurls little birds who leave a trail of clouds to walk across. 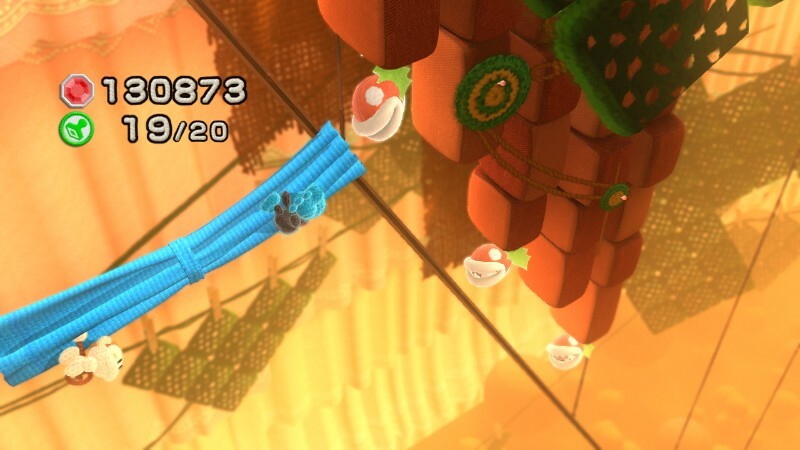 These are only a handful of these exceptional levels, and if every course was like this, Woolly World would get my Wii U game of the year award, hands down. 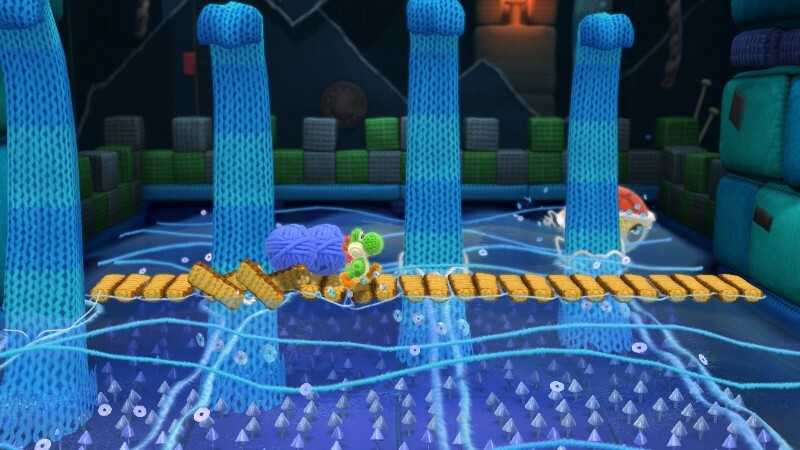 As far as replay value, there is quite a bit in Woolly World. There are six main worlds to beat, each with 8 courses. As if that wasn’t enough, finding all the Flowers, Wonder Wool and Stamp Patches in each world is quite a feat, and doing so will unlock a hidden 9th course. Though I have only managed to unlock one of these so far, if it’s anything to go by, the hidden courses are all incredibly challenging. This one in particular consisted of a entire stage of rushing waves of water, and absolutely no ground or checkpoints. You have to hover constantly, timing it right to land on the crest of a wave. Throw in a few Piranha Plants and Shy Guys, and this level is more challenging than any stage in the original Yoshi’s Island. That’s particularly impressive to me, and I highly anticipate unlocking and besting all of these hidden stages. As if that wasn’t enough, by beating all 6 worlds you unlock something called the Boss Tent, where you can face off against more difficult forms of each boss in the game for even more prizes. 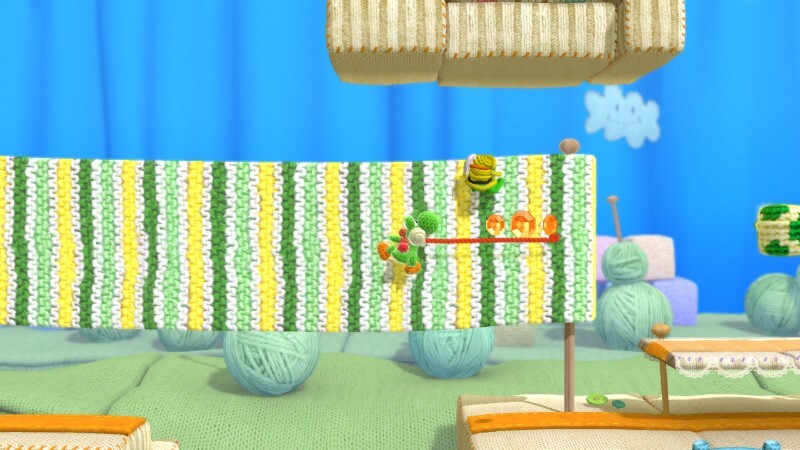 Overall, I was very pleased with Yoshi’s Woolly World. My playthrough took around 13 hours, and that’s without finding all the hidden goodies. When you factor that in, you probably have 15-20 hours of fun, more if you decided to take things slow and play on Mellow Mode, or try out co-op with a buddy. 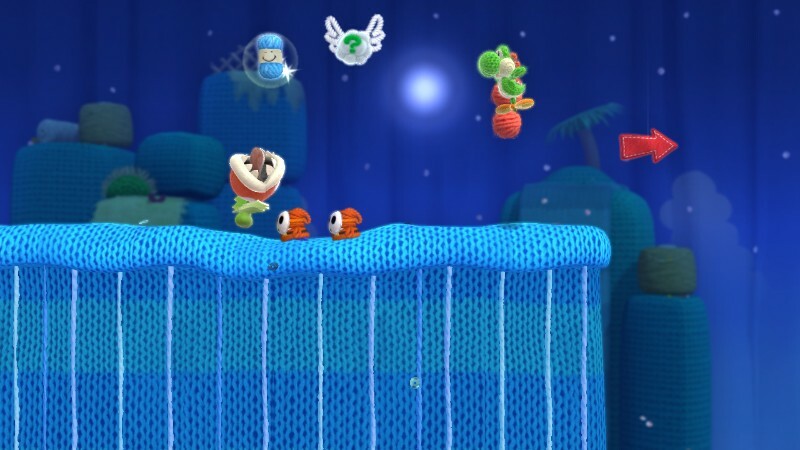 It took 20 years, but I feel Woolly World is the successor that Yoshi’s Island has always deserved. I’m really happy with it, and it truly shows how talented Good-Feel is at treating a beloved franchise with care and respect. I highly recommend this to fans of Yoshi, young and old, and hope this isn’t the last adventure for Mario’s plucky dinosaur steed. Review Copy Purchased by Author; Author bought the amiibo bundle for $59.99.